I am a fan of all sorts of cheeses: hard, melted, fondue, spreadable– you name it. But by far my favorite is the kind that oozes onto the pan when you’re baking and gets super crispy in the process. You know what I’m talking about. 10 times out of 10 I am going to pick that burnt cheese off of the baking sheet and love every second of it. 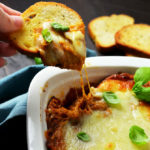 When browned, cheese undergoes some chemical reactions that causes it to have deeper, nuttier, richer, and more complex flavors (in fact, this happens to all foods). The browning process responsible is called the Maillard reaction, which you’ve probably heard about before if you’re interested in food science. It’s the reason we crave the corner piece of lasagna, with its crisp noodles; the camp fire-charred marshmallows; the blistered, coal-fired pizza; and the grill-marked meats. 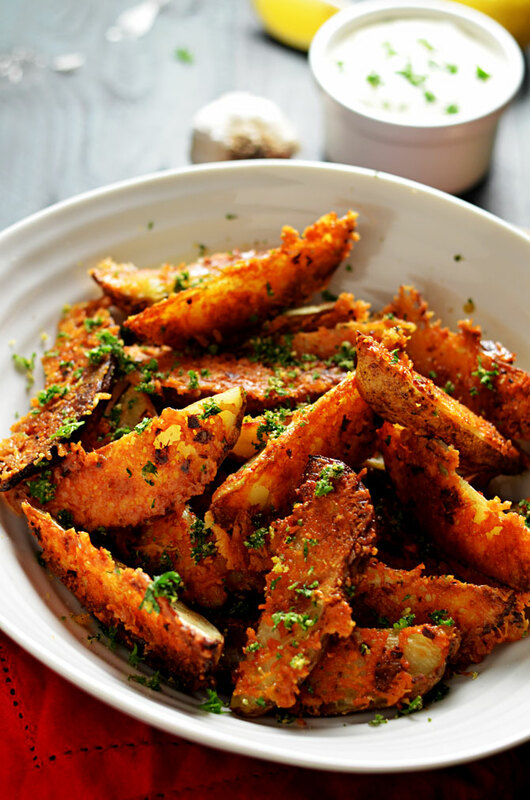 It’s the reason I make Parmesan and Garlic Crusted Baked Potato Wedges. 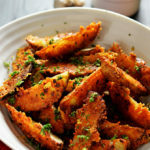 To make these wedges perfect, I first boil them in vinegared water, which helps to cook the potato through while keeping it from getting mushy or falling apart in the baking phase. Then, I melted butter onto my baking sheet, and sprinkled shredded parmesan and minced garlic liberally on top. You can also use grated parmesan, if you prefer, or experiment with other hard cheeses. Just make sure you don’t try this with high-moisture cheeses like fresh mozzarella, as they won’t crisp up the same and will get too oily. Once my cheesy, buttery, garlicky layer is all prepared, I place the potato wedges on top, making sure that one of the skinless sides is down, touching the cheese. Then I bake them until they’re golden and the cheese is very crisp. It’s important to let the wedges rest for 5 minutes after removing them from the oven, or the cheese will not set and it won’t adhere to the potatoes. You’ll probably find at this point that the wedges are difficult to remove. 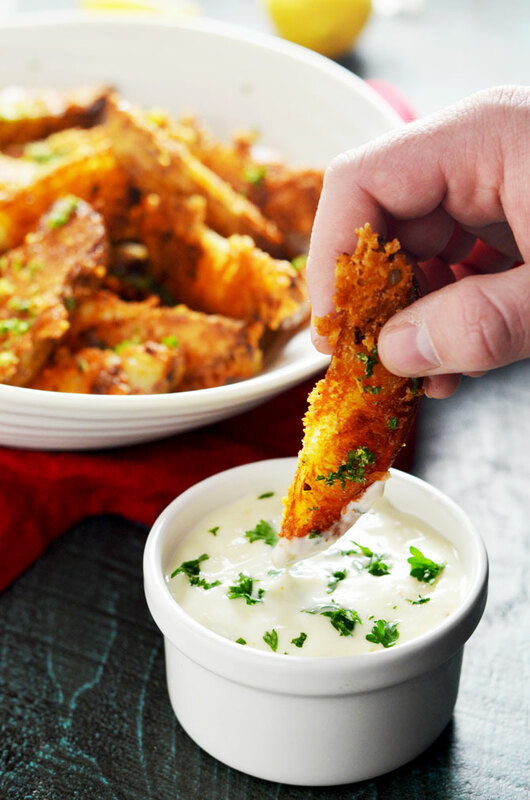 Using a metal spatula, break apart cheese in between each wedge, and then scrape the cheesy wedges away from the pan. 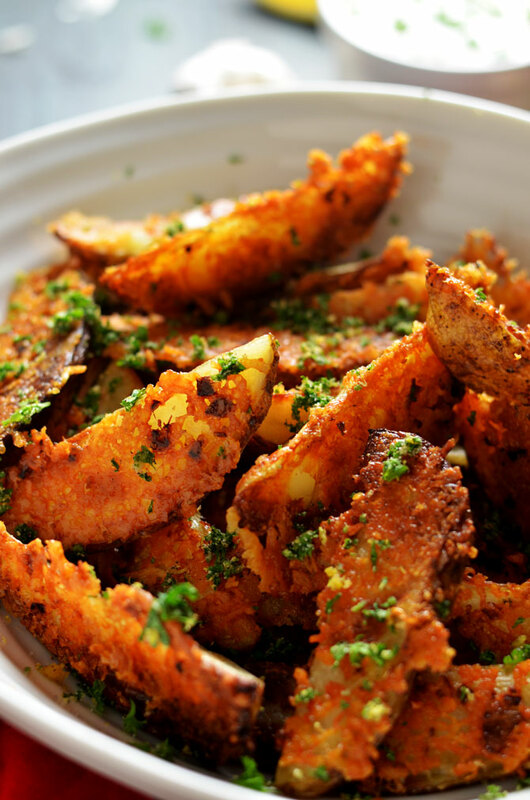 Once I do this, I place the wedges in a bowl, top with parsley, lemon zest, salt and pepper, and serve them warm. They’re delicious on their own, but I like them even more when I dip them in warm marinara. Mmmmm. As you can tell from the picture above, James prefers to eat his with ranch or aioli. Delicious either way. I also made a quick how-to video, to illustrate… well.. “how-to”. Check it out. Not too shabby for my second video ever, I think. I could definitely get the hang of this! 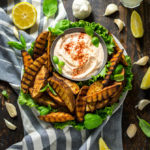 When you give the recipe a go, don’t forget to tag #hostthetoast on Instagram or Twitter to show off your Parmesan and Garlic Crusted Baked Potato Wedges. You’ll make all of your fellow burnt-cheese-scraper friends jealous, for sure. I’m a burnt cheese sorta gal myself. These look phenomenal! it’s not everyday that one can say: I learned something new!!! your tip about putting vinegar in the water to cook potatoes is new to me. have to go shopping & then i’ll make these; can’t wait. 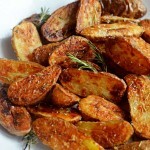 do u use vinegar for cooking potatoes for other recipes? mashed, hash browns? i’m so curious. Tried this recipe over the weekend and really liked it. Thanks for the fantastic idea. I might bake for a bit less tonight since the cheese was a little too burnt. Looking forward to trying this. Usually I just coat the wedges in oil and cheese/spices/herbs/garlic and pop them in the oven for about 40 min but I’m interested in the boiling with vinegar step!